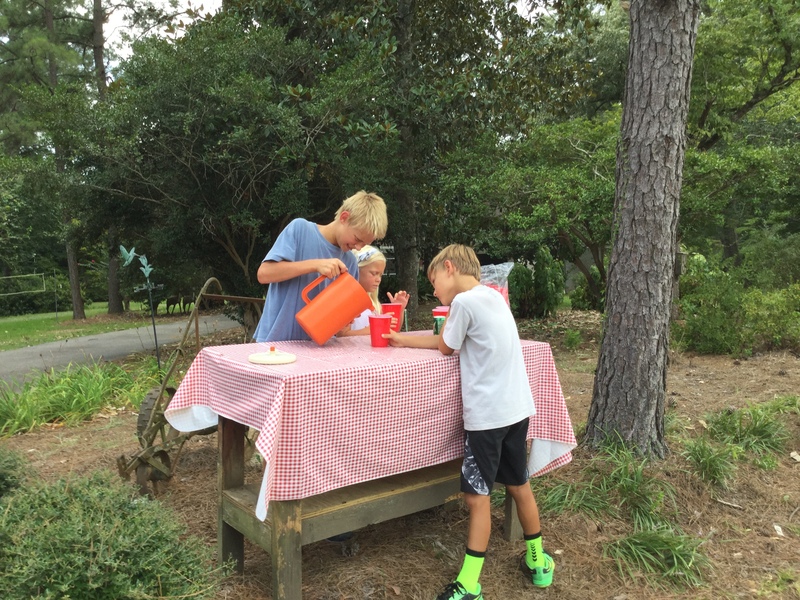 When our three grandchildren from Birmingham spent a few days with us in July, there was one thing of several they wanted to be sure and do: have a lemonade stand. The boys had done it before and Mattie was ready to be a part of the fun. Since some folks have asked me what in the world is a lemonade stand, I’m going to tell you how we did it. First, we studied the weather and decided on the very best day. With only three days to choose from, this was very important. To have successful sales one must have a hot bright afternoon. Going by the weather predictions, we chose Monday that week. I prayed the weather forecasters were right, that the showers would wait until Tuesday! Next we went to the store for supplies. I told them they could use any of my supplies already in the house for free, but they would need to pay me back for what they purchased at the store. It doesn’t hurt to learn some business rules very young! We bought lemons and cups and poster paper for signs. At home again, we had lunch and then went right to work. They shared the work of making the signs, one for each direction saying boldly “Homade Lemonade $1.00.” Then Mattie washed lemons; Thomas rolled them to make them juicy and cut them in half. William operated the juicer. The sugar went in with a bit of jostling so some ended up on the floor. Then the water was added and the tasting began. Finally satisfied that this was fantastic lemonade, we were all ready to set up out by the street. Fortunately, Grandaddy had placed a nice sturdy table for us already to which we added a cheerful red and white checked oil cloth. The table was in a safe place away from traffic but in full view with room for the children to hold their signs up, one east and one west. They worked out for themselves the division of labor. William would be the treasurer and pour the lemonade. Thomas and Mattie would hold the signs and yell out “Fresh homemade $1.00” and then would deliver the cups of lemonade to the customers. Guess what Nana got to do? Sit back and watch and, occasionally, add insect repellent to little bare legs or insist on some hand sanitizer! Here they are serving lemonade on that hot afternoon! There were several customers and excitement was running high. Then came a lull in business. Discouragement began to set in. I prodded them to stick with it a little longer and, bingo, another car pulled in. They were ecstatic! Their little faces would shine so brightly as a car approached and then swiftly fall as a friendly person would wave and drive on by. “Maybe they’ll be back in a minute,” William said. And that did happen sometimes. When we tallied up at the end, after they paid for lemons, the cups they used, and two pieces of poster paper, they each earned $5.43. And we all considered it a very good day. Especially since some lemonade was left so we could have a nice cool cup for ourselves! Thanks ever so much to each customer who stopped along their way to buy lemonade that July day. You made three children and a nana very happy!